Fayetteville, Arkansas - Ashton Eaton sets new World Record in Heptathlon with 6499 points, scoring 23 extra points for Dan O'Brien's 6476. The score shines specially considering World Indoor Championships had just finished a couple of hours before in Doha, Qatar, with the reigning World champion Bryan Clay winning the title with 6204 points. wow! what a great results for decathlonist! for decathlonist to run 2.32 in 1km and be so speedy in same time is fantastic! .This young man is amazing! He is world class in all but the shot put--and his throws will follow soon. Look at all those PBs! 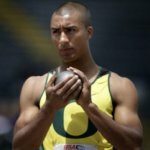 Congratulations, Ashton Eaton! Me to, I was looking, following and counting the points he needed to break the record, but running 2.32.67 for a sprinter like he is, is awesome, isn't it ?! He broke also the worldrecord for the Running (group of events) that was allready his'(2985 points) but also the second day worldrecord (2938 points) (previous Erki Nool with 2898 points). In the 1000m Curtis Beach also broke the worldrecord! He managed to do 5533 points thanks also to a very good 2.27.88 time for the last event! unbelievable, were was the competition? Great! To help American audiences you might also list each event with American units of measurement as well. How about details on Ashton--age, height, weight and school? I am not concerned about Eaton's throws. Even if his throws stay on par this year (13.00 - 41.25 - 53.00), his amazing runs and throws could give him a 400-point improvement, to 8,650. What's stunning about his achievement this past weekend is that all seven of his mark equaled or surpassed his personal bests during heptathlons. This shows that he is improving all around--even in the shot put! I like this decathlete for several reasons. First, one look at his record (www.decathlon2000.com/pdf/person/Eaton.pdf) shows that he competes regularly. Second, his remarkable progression in every event is evident. Third, he has a strong chance of appearing on the top ten of all four running events, including breaking Bill Toomey's 42-year-old 400 meter decathlon record of 45.68. Fourth, he is only 22, so the sky is the limit. I truly believe that he has several 9,000-point performances in him, with 9,150 within reach. Ok, three from the USA in that case...but come on, is the record holder! Thanks and congratulations for everybody. Eaton, the people arround him and of course the supporters, is a happy day for combined events fans! Great WR for Ashton, and many thanks to Curtis Beach who paced the 1000 for several PR (6 sub 2.40). Why Ashton was not compeeting for the title in Doha? I am looking forward to Götzis. Could be an interesting line-up this year. Clay (9000 pts. at last?). In my book Snel, Hoog, Ver - Geschiedenis van de tienkamp, 2008, Bryan states that there is room for improvement in all ten events. Ashton Eaton ran a 46,42 in the 4x400m relay! In total no more than two male and two female athletes from any one Member will be invited. Upon refusals or cancellations, the invitations shall be extended. In the men’s Heptathlon, Aleksey Drozdov (first on the 2010 World Indoor lists), Oleksiy Kasynov (2nd) and Andrei Krauchanka (4th) have been invited based on their standings. Beijing Olympic champion Bryan Clay and World record holder Roman Sebrle have been invited at the discretion of the IAAF. Only Ashton Eaton of the United States who currently stands in second on the 2010 World Indoor lists declined the IAAF’s invitation as it clashes with the NCAA Championships at which he is scheduled to compete. Chris, I will send all data to you (in next week). Per IAAF statement, during Tallin competition, Ashton Eaton took off 40 cm behind the board in long jump. That means he really lept 8.17, which is worth 1104 pts, 102 more than for 7.77. If he high jumped on his 2.11 level, the score would be 93 pts higher. Then, his score would be 195 pts better, total 6763. Fantastic. Unbelievable. But I believe, he can do even better.